Why do children get Otitis Media? Notice the ADULT eustachian tube is mature and sloping. This does not happen in children until the age of 8yrs.A child’s eustachian tube is shorter than an adult’s and almost horizontal. Because of this, middle ear fluid may not drain down the tube very well and nasal secretions and fluids may reflux (flow) into the eustachian tube more readily than in an adult. Children get middle ear problems because their eustachian (pronounced ‘you-stay-shun’) tube is immature and does not allow air into the middle ear properly. The eustachian tube keeps your middle ear healthy by allowing little puffs of air to enter unnoticed during the day, most often when swallowing. This is why it is SO IMPORTANT for children to blow their nose, blocking one side at a time, to clear each Eustachian tube, allowing air into the middle ear. 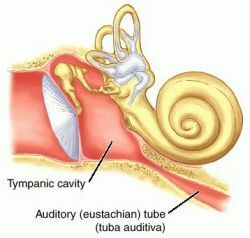 Normal middle ear function relies on normal Eustachian tube function. The eardrum can only vibrate normally when the ear canal and the middle ear are both full of air. The eustachian tube has 3 functions. 1) to allow air to pass up or down the tube this keeping the air pressure equal on both sides of the eardrum. 2) to allow middle ear secretions to drain down the tube into the nose. 3) to prevent the reflux (flow) of fluid back up the tube into the middle ear. to fully empty each nostril is the only way to truely clear each Eustachian tube. The middle ear is normally full of air. Small amounts of air must continually pass up the Eustachian tube to ensure the middle ear remains full of air. The eustachian tube is normally closed and only opens momentarily during swallowing and yawning. We normally swallow several times a minute while awake and once every 5 minutes while asleep. Eustachian tube function improves as children grow and this is one of the reasons why Otitis Media is less common as children get older. You are frequently aware of the eustachian tube when your ear ‘pops’ during swallowing or nose blowing, or when you ‘hear yourself talking’ in your ear during a yawn. When an airplane is landing, many people attempt to relieve middle ear pressure by blowing their nose while it is pinched shut to send air up the eustachian tube. 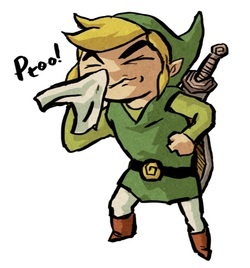 During a cold or allergy attack, your ear may feel congested or ‘stuffy’ because the lining of the eustachian tube swells up and blocks off the flow of air.